climate we’ve needed to become very froogle. Our operatives are trained and qualified to operate a wide range of access platforms from specialist compact machines which will fit through a single doorway, to large hydraulic truck mounts. Access platforms allow us to access confined spaces, with variable width jacking. Our equipment provides excellent working height and outreach capabilities. Access platforms enable us to set up and be operational within minutes of arriving on site. Our water fed pole cleaning system uses a 6 stage reverse osmosis water purification technology which de-mineralises and de-ionises tap water to remove impurities and produce pure water. Pure water is the best product to clean windows for number of reasons, because of the aggressive strength of pure water you do not need to use cleaning detergents on the windows therefore you save money and time, plus it's better for the environment! 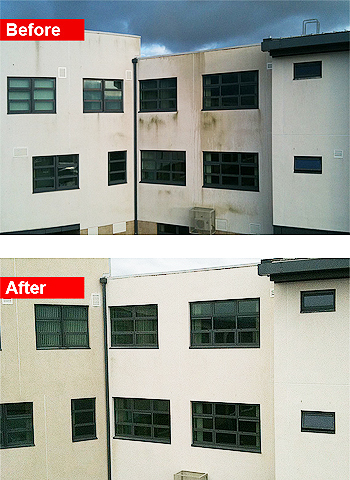 • For cleaning windows, glass roofs, signs, atrium's, skylights, canopies and facades. • Health and Safety issues, making it by far the safest and most cost effective method of cleaning as our operatives work from the safety of ground level. We offer full builders cleans and sparkle clean packages to building, construction and maintenance companies, cleaning up after renovation, new builds or revamps. Our highly skilled staff will clean the building internally and externally, from top to bottom, cleaning away all dust and debris, leaving the premises looking clean as new and ready for your customers to move right in. Whatever your commercial cleaning needs may be Sparkle Cleaning Ltd will have the right solution. We have the most reliable and flexible teams for commercial cleaning. Glasgow based, we travel throughout Scotland and our prices are always competitive and affordable. Call us today on 01563 526538 to discuss your cleaning needs with one Commercial Cleaning Glasgow consultants. are your specialist End of Tenancy Cleaners in Glasgow! Our team will enter your property and clean it from top to bottom, inside and out, including all appliances. We cover the West Side of Scotland, Ayrshire and Scotland's Central Belt Areas. These areas include: Anderston, Anniesland, Auchenshuggle, Baillieston, Balornock, Barlanark, Barmulloch, Barrachnie, Barrowfield, Blackhill, Blairdardie, Blochairn, Botany, Braidfauld, Bridgeton, Broomhill, Budhill, Cadder, Calton, Camlachie, Carmyle, Carntyne, Colston, Cowcaddens, Cowlairs, Craigend, Cranhill, Dalmarnock, Dennistoun, Dowanhill, Drumchapel, Easterhouse, Firhill, Garnethill, Garrowhill, Garscadden, Garthamlock, Germiston, Gilshochill, Greenfield, Haghill, Hamiltonhill, High Possil, High Ruchill, Hillhead, Hogganfield, Hyndland, Jordanhill, Kelvindale, Kelvinside, Knightswood, Lambhill, Lightburn, Lilybank, Linthouse, Maryhill, Maryhill Park, Millerston, Milton, Mount Vernon, Netherton, Newbank, North Kelvinside, Park District, Parkhead, Partick, Partickhill, Possilpark, Provanhall, Provanmill, Queenslie, Riddrie, Robroyston, Royston, Ruchazie, Ruchill, Sandyhills, Scotstoun, Scotstounhill, Shettleston, Sighthill, Springboig, Springburn, Springhill, Stobhill, Summerston, Swinton, Temple, Tollcross, Townhead, Whiteinch, Woodlands, Yoker, and Yorkhill.